On many occasions, physicists, other scientists, and engineers need to make approximations or “guesstimates” for a particular quantity. What is the distance to a certain destination? What is the approximate density of a given item? About how large a current will there be in a circuit? Many approximate numbers are based on formulae in which the input quantities are known only to a limited accuracy. As you develop problem-solving skills (that can be applied to a variety of fields through a study of physics), you will also develop skills at approximating. You will develop these skills through thinking more quantitatively, and by being willing to take risks. As with any endeavor, experience helps, as well as familiarity with units. These approximations allow us to rule out certain scenarios or unrealistic numbers. Approximations also allow us to challenge others and guide us in our approaches to our scientific world. Let us do two examples to illustrate this concept. Can you approximate the height of one of the buildings on your campus, or in your neighborhood? Let us make an approximation based upon the height of a person. In this example, we will calculate the height of a 39-story building. Think about the average height of an adult male. We can approximate the height of the building by scaling up from the height of a person. You can use known quantities to determine an approximate measurement of unknown quantities. If your hand measures 10 cm across, how many hand lengths equal the width of your desk? What other measurements can you approximate besides length? Figure 1. 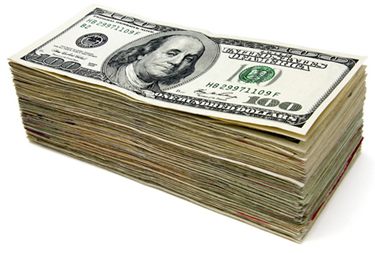 A bank stack contains one-hundred $100 bills, and is worth $10,000. How many bank stacks make up a trillion dollars? (credit: Andrew Magill). The U.S. federal deficit in the 2008 fiscal year was a little greater than $10 trillion. Most of us do not have any concept of how much even one trillion actually is. Suppose that you were given a trillion dollars in $100 bills. If you made 100-bill stacks and used them to evenly cover a football field (between the end zones), make an approximation of how high the money pile would become. (We will use feet/inches rather than meters here because football fields are measured in yards.) One of your friends says 3 in., while another says 10 ft. What do you think? When you imagine the situation, you probably envision thousands of small stacks of 100 wrapped $100 bills, such as you might see in movies or at a bank. Since this is an easy-to-approximate quantity, let us start there. We can find the volume of a stack of 100 bills, find out how many stacks make up one trillion dollars, and then set this volume equal to the area of the football field multiplied by the unknown height. The final approximate value is much higher than the early estimate of 3 in., but the other early estimate of 10 ft (120 in.) was roughly correct. How did the approximation measure up to your first guess? What can this exercise tell you in terms of rough “guesstimates” versus carefully calculated approximations? 1: Using mental math and your understanding of fundamental units, approximate the area of a regulation basketball court. Describe the process you used to arrive at your final approximation. Scientists often approximate the values of quantities to perform calculations and analyze system. 1: How many heartbeats are there in a lifetime? 2: A generation is about one-third of a lifetime. Approximately how many generations have passed since the year 0 AD? Figure 2. 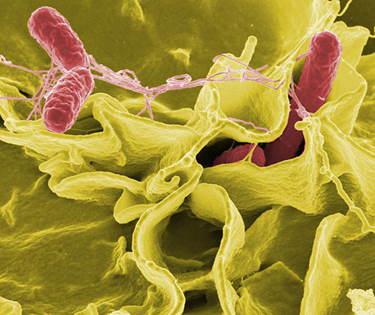 This color-enhanced photo shows Salmonella typhimurium (red) attacking human cells. These bacteria are commonly known for causing foodborne illness. Can you estimate the number of atoms in each bacterium? (credit: Rocky Mountain Laboratories, NIAID, NIH). 5: Approximately how many atoms thick is a cell membrane, assuming all atoms there average about twice the size of a hydrogen atom? 6: (a) What fraction of Earth’s diameter is the greatest ocean depth? (b) The greatest mountain height? 7: (a) Calculate the number of cells in a hummingbird assuming the mass of an average cell is ten times the mass of a bacterium. (b) Making the same assumption, how many cells are there in a human? 8: Assuming one nerve impulse must end before another can begin, what is the maximum firing rate of a nerve in impulses per second? 1: An average male is about two meters tall. It would take approximately 15 men laid out end to end to cover the length, and about 7 to cover the width. That gives an approximate area of . Sample answer: if an average human lifetime is taken to be about 70 years. 1.4 Approximation by OpenStax is licensed under a Creative Commons Attribution 4.0 International License, except where otherwise noted.